Patricia Sprinkle reads from Friday's Daughter. Patricia Sprinkle reads from Hold Up the Sky. Patricia Sprinkle signs Hold Up The Sky. Patricia Sprinkle, What Are You Wearing to Die?. 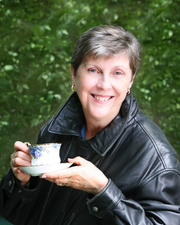 Patricia Sprinkle is currently considered a "single author." If one or more works are by a distinct, homonymous authors, go ahead and split the author. Patricia Sprinkle is composed of 7 names. You can examine and separate out names.